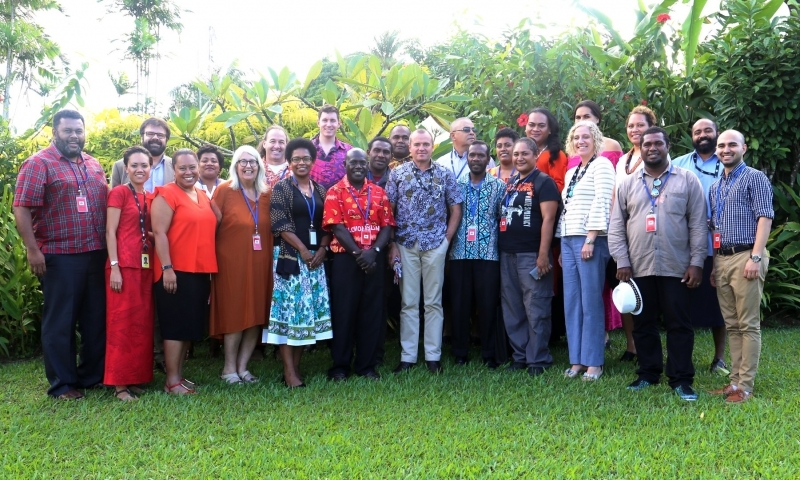 A capacity building program on Business, Human Rights and the Sustainable Development Goals was organised in Suva, Fiji from April 30 to May 4. The program was organised by Diplomacy Training Program (DTP) in partnership with the Pacific Islands Association of NGOs (PIANGO), Citizens Constitutional Forum (CCF), the UN’s Office of the High Commissioner for Human Rights (OHCHR), Business & Human Rights Resource Centre, and the UNSW Institute for Global Development. The regional program brought together participants, representing civil society organisations, from eight Pacific Island countries. The program helped build knowledge of international human rights standards and mechanisms that can be applied and integrated into effective advocacy strategies and address the challenges of unchecked economic encroachment. Program participants also had the chance to visit the Australian High Commission in Fiji hosted by Australian High Commissioner John Feakes. Participants had the chance to engage in discussions on human rights within the business community in the Pacific region. Sessions were led by Professor Surya Deva - Member of the UN Working Group on Business and Human Rights (UNWG), Amy Sinclair – Regional Representative, Business & Human Rights Resource Centre, Joshua Cooper – Academic in Human Rights Law, and Patrick Castellan and Dip Magar from the OHCHR Regional Office for the Pacific.